This route stes off next to Malaga and the sea, covering a great deal of the eastern Costa del Sol, from Rincón de la Victoria to Torre del Mar where it heads inland along a fertile plain of olive groves and vineyards which surround Vélez- Málaga. 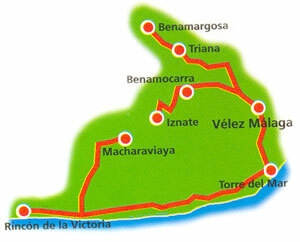 Roads which lead further inland take us to charming rural villages such as Benamocarra, Benamargosa and Iznate. Along the route we take in the atmosphere and bustle of the coastal tourist resorts as well as the peace and quiet provided by beautiful spots such as Macharaviaya. Culture and a wealth of monuments complement perfectly with the deepest traditions of a warmly welcoming people who know how to treat their visitors well. El Rincón de la Victoria, Belizmiliana to the Arabs, is home to great surprises, such as the Cueva del Higuerón ( Cave of Treasure) with its ancient wall paintings. Close by the remains of the Castle of Bezmiliana recall a romantic Muslim past. The Vélez River estuary houses Phoenician and Carthaginian tombs, backing the hypothesis that this was the site of the town of Mainake. All along the route numerous parish churches, of greater and lesser artistic worth, are spread out among the different towns. However without doubt the area of greatest monumental wealth is concentrated in the area capital: Vélez Málaga. The town´s current location is deeply Arabic, as recalled by the recently restored Alcazaba, or Fortess. The Fortes´s solid walls from an attractive image with the whitewashed houses which fall away at its feet, interspersed with church spires among their rooftops. The Church of San Juan Bautista and Nuestra Señora de la Encarnación and the Church of Santa María la Mayor, both from the 16th century, are good examples. As with these buildings, a great deal of the temples of La Axarquía are built upon former mosques, with monarets converted into belltowers. Other excellent examples of religious buildings include the Convento de San Francisco, built upon the old Jewish quarter and found in an attractive setting of narrow winding streets, of clear Arab inspiration. The sense of tradition of the people of la Axarquia is expressed each year in the Procesion Marinera de la Virgen del Carmen. Colorfully decked out boats, set against the tenuous light of dawn, accompany the image of the Virgin of the seas in a show of great artistry.